A review from Stefano Gulizia on the blog “Verbunkos”. Read the whole thing here. …The chamber music performed by Woods and his Ensemble Epomeo is an exemplary site for thinking together not only about the legacy of Hans Gál and Hans Krása, but also about the current state ofEntartete Musik as belonging to a time that is ‘out of joint’, for thinking about spectrality and for thinking about a future of small-sized orchestral music whose enlightenment is indissociably bound with the exemplarity and clarity of their execution and what they have to teach us. We might see Gál and Krása, then, as a sort of night watchman in ghostly gathering: they have come to tell us about the non-contemporaneity with itself of the living present, and to suggest, Hamlet-like, that time is off its hinges. On Sunday, the 23rd of February, Ensemble Epomeo and shakuhachi virtuoso James Schlefer will give the world premiere of composer Victoria Bond‘s new work for shakuhachi and string trio, “Rashomon.” We asked Maestra Bond a few questions about her new work and her distinguished career. EE Your new quartet is titled Rashomon. Most people will recognize the title from the iconic Kurosawa film. Can you tell us a little bit about your use of the title- is the piece based on the film, and if so, how? VB: I have actually based my composition on two short stories by the Japanese author Ryunosuke Akutagawa; “Rashomon,” and “In a Bamboo Grove.” These, in turn, were taken from Konjaku Monogatarishū’s Anthology of Tales from the Past, also known as the Konjaku Monogatari, a Japanese collection of over one thousand tales written during the late Heian period (794-1185). The volumes cover various tales from India, China and Japan. The subject-matter is largely drawn from Buddhist and secular folklore. The folkloric tales mostly depict encounters between human beings and the supernatural. The typical characters are drawn from Japanese society of the time — nobility, warriors, monks, scholars, doctors, peasant farmers, fishermen, merchants, prostitutes, bandits, beggars. Their supernatural counterparts are oni and tengu. The work is anonymous. The date of the work is also uncertain. From the events depicted in some of the tales it seems likely that it was written down at some point during the early half of the 12th century, after the year 1120. Many of the tales which appear in the Konjaku are also found in other collections, such as ghost story collections; having passed into the common consciousness, they have been retold many times over the succeeding centuries. Modern writers too have adapted tales from the Konjaku Monogatarishū: a famous example is Akutagawa Ryūnosuke‘s In a Grove, well known in the West from Kurosawa‘s film Rashomon. EE- Rashomon is structured as a theme and variations, one of the oldest Western musical forms. What is the appeal for you of this formal structure as composer working today? Is your approach to variation form in this work based on any existing formal models? EE- The Rashomon story suggests a strong Japanese influence on the piece. Did you feel like the sound of the shakuhachi almost mandated some Japanese element in either the musical language or programmatic structure of the piece? VB: The theme itself has a Japanese character, being a descending pentatonic scale with an ambiguous chromatic element. In addition to the shakuhachi, I also wanted to imply the sounds of traditional Japanese instruments in the string parts. EE-Does the piece have any typically Japanese melodies or stylistic traits? VB: The melodic material is original, though influenced by traditional Japanese melodies and timbres. EE- If so, had you ever written in a cross-cultural style before? VB: I have been influenced by many cultures, having travelled extensively as part of my life as a conductor. Some of those cultural influences are: Chinese, Brazilian, Irish, Puerto Rican, English, French, German, and Italian. EE-Are there different challenges working with material from a non-Western musical tradition? VB: The challenge of working with materials from other cultures is to maintain one’s musical identity and not to simply adapt folkloric influences. My desire is to absorb these influences and make them my own, so that they become part of the musical fabric of my creative world. EE- You’ve managed to maintain a diverse and successful career as both a conductor and composer- that’s quite an achievement. How has composing shaped your work on and off the podium? Do feel you study scores or rehearse differently because of your experience as composer? VB: Having a double life as composer and conductor has many advantages, the principal one being an intimate and working knowledge of the literature and of performers. I approach the study of a score looking for clues, and asking myself “why has the composer made these decisions?” These insights become an important component in shaping my interpretation of a work. Conducting instrumentalists and singers gives me valuable insight into what works technically and dramatically for each artist in the context of a given work, and especially what doesn’t work. This information becomes an essential part of my own compositions. I often feel as though I have had the opportunity to be my own “Composer-in-Residence” during a rehearsal period with an orchestra, opera company or chamber music ensemble. The one great challenge of maintaining a conducting and composing career is that of time, and in that regard, I have decided that composing is more important to me, and I am devoting the majority of my time to it, cutting back on all of my conducting activities. EE- What are your conducting and compositional ambitions for the future? Pater Patriae, a concerto for flute and wind ensemble, using material adapted from fife and drum tunes of the revolutionary period. EE– What music excites you these days? Have there been any “wow” moments in the last year or two where you discovered a new piece, a new work or a new insight into a familiar one that really made a huge impression. VB: I produce a new music series called Cutting Edge Concerts New Music Festival each year in New York, and present a wide variety of composers and performers throughout the month of April at Symphony Space in Manhattan. This allows me to be in touch with established as well as emerging composers, and I have so many positive impressions of what is being written today, that the list would be very long! 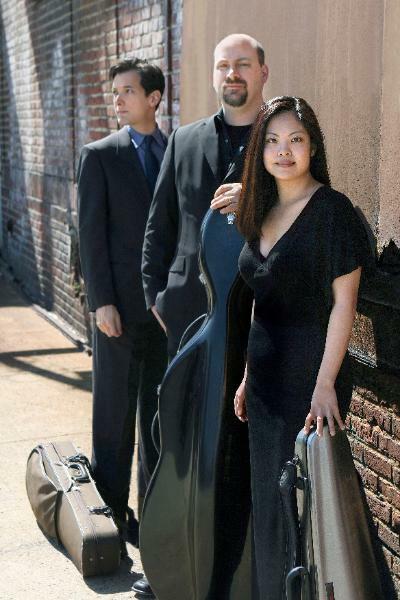 Ensemble Epomeo – Diane Pascal, violin; David Yang, viola; and Kenneth Wods, cello with James Nyoraku Schlefer, shakuhachi. And exciting combo os shakuhachi and strings featuring two new KSA premieres: Rashomon by Victoria Bond, for shakuhachi and string trio and Sidewalk Dances by James Nyoraku Schlefer for shakuhachi and cello. Plus Beethoven, Kurtág and Weinberg. The Avie catalogue now boasts no fewer than ten discs featuring major works of Hans Gál (1890-1987), the Vienna-born composer who settled in Edinburgh after being forced to flee by Hitler’s annexation of Austria in 1938. His music is well worth hearing. Gál’s musical roots lie with Brahms and Strauss; his style ‘remained resolutely uninfluenced by the output of Schoenberg and his school’, as Conrad Wilson notes succinctly in New Grove. He has a great gift for melody and lyricism, amply demonstrated in his first work for string trio, the Serenade of 1932. It is a refreshing piece in four movements, lasting thirty minutes. The intricately contrapuntal first movement Capriccioso has a jaunty, Haydnesque feel, with lightning-fast changes of mood. There follows a congenial Cantabile with long-breathed melodic lines, a deliberate but elegant Menuetto and a crisp-textured Alla Marcia final movement imbued with humour. By 1971, when his threemovement Trio in F sharp minor Op. 104 was written, Gál’s style had moved on, as evidenced by the winding chromatic phrases of the sombre first movement – although the second movement (a cheerful, catchy kind of perpetuum mobile) has much in common with the earlier trio. The work started life as a commission for violin, viola d’amore and cello from the London Viola d’amore Society, but Gál cannily made this version for traditional string trio simultaneously. Gál and the Czech-born Hans Krása shared a Jewish heritage, but whereas Gál escaped Nazi oppression, Krása was interred in Theresienstadt where he was instrumental in organising the cultural life of the concentration camp, before dying in Auschwitz in 1944. Both his string trios were composed in the last year of his life. Tanec (Dance) is a short, unsettling work, much of it revolving around the sound-world of trains. His Passacaglia and Fuga for violin, viola and cello is more substantial, the short and very spirited fugue being preceded by a Passacaglia with a gravely beautiful opening that transforms into something quite combative. Ensemble Epomeo give eloquent and convincing performances. Should you be interested in listening further to Gál’s music, I would recommend the second and fourth symphonies, the latter having very much the feel of late Strauss. A new review from the popular website MusicWeb-International for our debut CD from critic Steve Arloff. The disc has been selected by MusicWeb as a RECORDING OF THE MONTH for October, 2012. The complete review follows below, but shouldn’t you go ahead and order the CD first? It seems that at last the star of Hans Gál is in the ascendant with symphonies (2;3;4), hisviolin concerto,cello concerto,cello works,violin and piano works,piano trios,piano duosand piano solo music (reviewreview), to name a few, being released in recent years. This is a vast improvement upon the situation that pertained only in 2001 when there were but three works by him that could be found on disc; today the total tops 40. Born in Vienna of Hungarian Jewish extraction Gál not surprisingly left Germany where he had worked as Director of the Conservatory in Mainz after he was dismissed by the Nazis and his music was banned. First he returned to Vienna until Austria was annexed by Hitler in 1938 then he came to the UK though he had a hard time of it with a wife and two children and no immediate job. In May 1940 he was incarcerated due to the panicky atmosphere that pertained in Britain at the time, firstly in Huyton then in the internment camp in Douglas, Isle of Man. Though Gál was not classed as a category A alien all of whom were detained when war broke out, Churchill’s edict to “collar the lot” following the fall of France led to category B aliens and a large percentage of category C being arrested too, adding up to a total of over 27,000 internees. It is ironic that Jews who were the most obviously sympathetic to the Allies should have been included in this sweep. Eventually the folly of this policy was recognised and Gál and many others were released after a few months. For most of his long life he resided in Scotland where he added to the rich musical life there working at Edinburgh University until well beyond retirement age. Gál’s Serenade in D Op.41 dates from 1932 and is a most delightful work full of free-flowing melodic lines with an upbeat Haydnesque beginning that belies what’s to come which is altogether more contrapuntal but still of a generally whimsical character and the first movement fairly skips along its ten minute length. Gál certainly knew how to write a good tune and wasn’t afraid to do so at a time when the avant-garde brigade were flexing their musical muscles and when to be experimental was deemed to be de rigueur. Though modern in character this music is totally beguiling and the main theme will easily become one of those little worms that play themselves over and over again in your mind and soon have you convinced that you’ve known it for years despite it being a world première recording. The second movement marked Cantabile. Adagio is a heartfelt, beautiful little tune that while darker is so gorgeously lush that it will still cause you to smile with delight. The main theme which is introduced by the violin is taken up at the close by the viola against a wonderfully rich background. The Menuetto is back to the Haydnesque style of the opening movement with the cello playing a significant role in conversation. The violin hovers above it in canon and one is tempted to speculate that Papa Haydn himself would have heartily approved of its inventive character. The final movement Alla marcia is another wonderfully melodious and brilliantly scintillating piece of writing. All kinds of clever musical devices propel things along and the work finishes with a flourish. Gál’s Trio Op.104 was composed almost forty years later in 1971 to a commission from the London Viola d’Amore Society and the version here for a conventional trio was written at the same time. It is a work that is altogether darker in mood than theSerenadeas perhaps is to be expected from a composer of over 80 as opposed to one of 42. In any event it is another example of this highly individual and marvellous composer who appears never to have been at a loss to come up with fabulous tunes that win the listener over on first hearing. While the opening Tranquillo con moto in dark and deeply reflective the Presto is light and humorous. It dances along its short length and leads into the finale Tema con variazione with seven distinct sections. The players’ cellist Kenneth Woods wrote the notes. He has perfectly captured the essence of this last movement which, as he puts it, incorporates “recurring cycles of despair and hope, without Gál ever tipping his hand as to whether the work is likely to end in darkness or light”. He explains further that Gál’s solution is to “avoid a resolution entirely” by concluding with an Alla Marcia in humorous mode. This alludes to the fact that whatever happens, life marches on and “The cycle of tragedy and hope is eternal, the root of all human comedy…” What better way to look at life and to share that outlook with others in musical terms that are so unambiguous. The two other works on this disc are by a composer from the same era, the same part of the world (central Europe), and the same Jewish heritage, who suffered the fate that Gál undoubtedly would have done had he not come to Britain when he did. Hans Krása was also sent to an internment camp and the insert in the CD shows a photo of each composer alongside their camps. However, Krása ended up in Terezin in the north of his native Czechoslovakia where he was active in the busy musical life that pertained there and like other composers confined there wrote several works in these inauspicious surroundings. Then in October 1944 he was moved to Auschwitz along with fellow composers Gideon Klein, Viktor Ullmann and Pavel Haas, where he was sent to the gas chambers just two days after his arrival. I find the thought of the deaths of these highly talented composers almost unbearable, particularly when I hear their music and imagine what other joys they would have brought to the world had they lived. Whilst rejoicing in the life of Hans Gál who lived to the age of 97 and whose music developed over a long and productive life it is heartrending to listen to the music of Krása who died at 45. Both works here were written in his final year. Krása, in common with his fellow composers in Terezin, refused to allow their Nazi captors to crush their spirit. These works are defiant responses to the madness that The Third Reich unleashed upon the world. In Tanec(dance) which title belies its content which is savage and biting, there are evocations of trains that contrast feelings of nostalgia with overt menace. I was reminded of Steve Reich’s Different Trains and am pretty sure that Reich may well have drawn inspiration from this work for his own. There is so much said in such a short piece it is quite overwhelming. In Passacaglia and Fuga, Krása’s last completed work, he expresses himself so profoundly it is enough to make you weep. Kenneth Woods’ excellent notes explain the musical structure perfectly which enables the listener to get so much more out of the music than they would without them. I’m not going to try to paraphrase or come up with my own interpretation which I couldn’t do in any case but will quote his summing up of the work as “…discussion degenerates into argument and argument descends into violence.” Who can wonder at such musical thoughts when you are knowingly heading for extermination for being born something your captors will not tolerate. The disc leaves you feeling profoundly moved as well as drained and I can hardly imagine how it must feel to play such music. This is an extremely important musical document on all counts as it introduces us to two hitherto unrecorded works by a great 20th century composer who exposure has at last revealed a huge talent and two works by a wonderful composer whose creative genius was snuffed out in his prime. 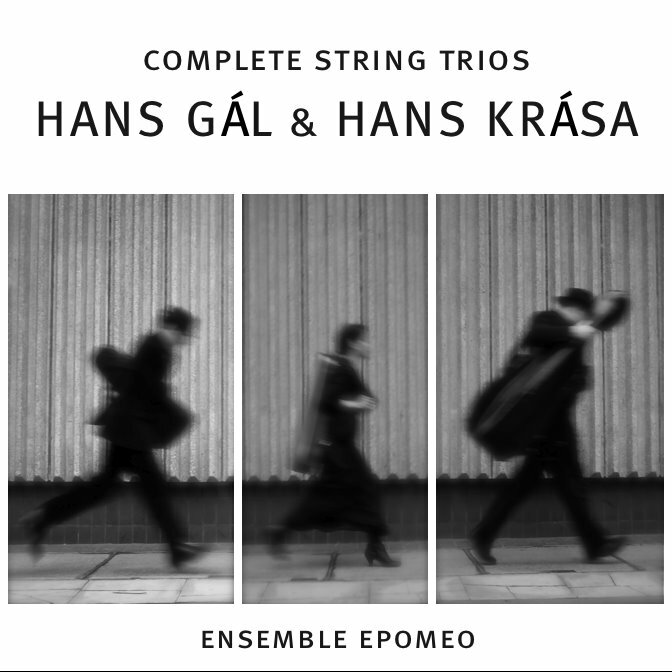 The Ensemble Epomeo play all four compositions with huge commitment and brilliant flair revealing every nuance in four wonderful works for string trio. These can sit alongside anything written in this genre. In every way this is a fantastic disc that listeners will want to hear again and again. 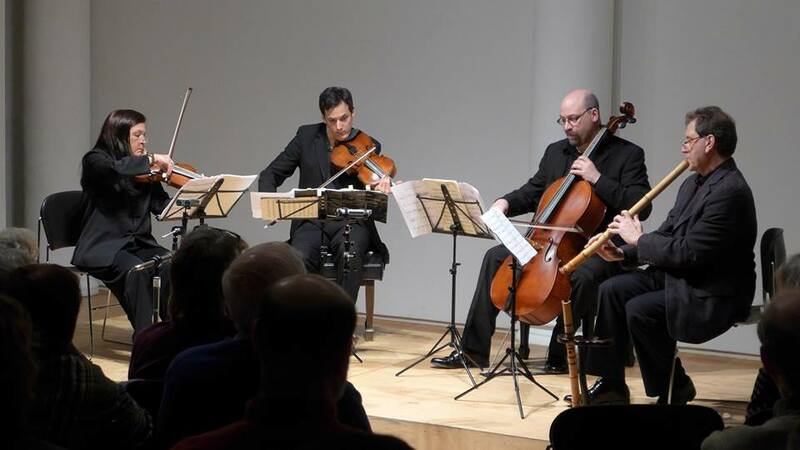 Re-Blog from Kenneth Woods- A view from the PodiumSo, this week, I’m in New England for concerts with Ensemble Epomeo– our first show is at theNewburyport Chamber Music Festival on Friday. This concert has an extra challenge for me- I have had to switch cellos. It wasn’t practical to travel this time with my Mariani, so I’ve brought my backup instrument. So, I’ve been very immersed with the Schumann on one cello, only now to switch to this very tricky trio program (Bach, Beethoven and a new work by Kile Smith) since the LCO rehearsal on Sunday. Monday wasn’t much help- I had a meeting with the record company about my upcoming Mahler CD with Orchestra of the Swan on Monday morning in London, then had a short meeting in Cardiff Monday afternoon and a rehearsal in Hereford Monday night. That left Tuesday to recalibrate my fingers before flying here yesterday.Lynn Harrell has a great piece on his blog about instruments and the insanity of letting families be bullied into trying to buy insanely expensive fine Italian instruments for student players.What I take issue with is the implied necessity of one of these priceless masterpieces in making a career. So a young player before he/she is near full potential musically or technically or earning power is led to believe that without that Stradivari or Guarneri they will not be able to compete and their very career will be in jeopardy. Throughout the entirety of my more than 50 year playing career I have yet to encounter a string player under the age of 20 with enough knowledge, musicality, and technique to bring everything out of a master instrument…The best new instruments are in many playing points superior to all but the most exceptional old instruments. Moreover, the cost is often laughably less expensive. The price range of $5,000- $50,000 will yield superb instruments. The renaissance of great new makers in the last 20 years proves this. It is therefore folly to assume at the onset of a career that one must have an old instrument to succeed. What succeeds is musical and technical brilliance.There really is no snobbery like instrument snobbery (even wine snobs can’t compare)- of course the best Cremonese instruments have very special properties, but I think only the best players can really make the most of those. On the other hand, a great player can still do great things on a more modest axe, and where budget is an issue, there are ways of maximizing what a more modest instrument can do.There is a new generation of budget instruments out there that are a far cry from the unplayable student monstrosities of the past. On one hand, dealers are happy to sell those (in volume), but they are not so happy to help you get the best out of them. I bought my second cello (Cello 2.0) when I was working in Oregon- I needed something that could live in the orchestra’s office when I was away, but that was good enough for concerts.I bought a simple Strad copy Chinese-made instrument (I shouldn’t be telling you this! ), but had it set up but a first rate luthier who made some simple modifications which improved the sound enormously- he also replaced the factory bridge and soundpost. I replaced the cheap strings with top-of-the line ones. Most importantly, I use my good bow with it, which is worth more than the cello. I can’t tell you what a difference it makes!This is something a dealer doesn’t want you to know- that a $2k-$6k cello with a bow of similar value might sound far better than a $28k cello with a $1k bow. More tellingly, buying a $50k or $500K instrument isn’t going to make you sound like Lynn Harrell. Young cellists and their parents should be well advised about how to get the most from their budget when shopping.Sadly, many, but by no means all, teachers are not to be trusted in this task. For years, many top dealers offered kick-backs to teachers who persuaded their students to buy an instrument from them. They say it is a “thank you” for the time involved in helping the student choose an axe- it sounds more like a bribe, to me. If everyone in your studio is playing a Berlusconi from El Pomposo Violins, chances are, someone is getting a commission you don’t know about. The fact that so many people don’t know about this practice is pretty indicative about how well some of these teachers can separate out their financial interests from the needs of their students.Anyway, I’ve used Cello 2.0 for high powered chamber concerts, several solo recitals and the Elgar, Herbert, Shostakovich and Chen Yi concertos with orchestra, and it’s held up quite well. There is a sweet comment about my sound on the website from Chen Yi– she’s talking about Cello 2.0, not the Italian one.However, some people can’t trust their ears and others just won’t take such an instrument seriously. When I did the Elgar, I wanted some work done on it- a new bridge, in particular. I took it to the “top place” in Portland, and they mistook me for an amateur/beginner based on the instrument. They then did a completely half-assed job, left the instrument sounding and playing like crap and told me it was un-realistic to expect any more from that instrument. When they saw a piece about me in the paper, they got a little more helpful, but the cello left their shop sounding like a student instrument. I had to find another luthier to fix what they’d screwed up.When people used to compliment me on my sound with that instrument I’d gleefully tell them what it was, until I saw that most reacted with horror, as if I’d hoodwinked them into thinking they were listening to something they weren’t. How sad that they couldn’t trust their ears.My teacher at IU, Fritz Magg, had a beautiful Strad which he had to give up at the end of his career. He had a fine copy made by a good but not famous luthier, and went on playing. Everywhere he went, people talked about the unmistakable glory of that legendary Strad, and Fritz just nodded and smiled. What they were hearing was the unmistakable glory of Fritz Magg, but if they knew he was playing on an in-expensive modern instrument their ears would have instantly closed. Fritz was wise enough to just nod and smile as folks talked on and on about the miracle of the Strad they handn’t just listened to.Post script- In aiming for brevity, I don’t want to leave readers with the mistaken impression that all instruments are the same. Far from it! However1- There are decent instruments to be found in every price range2- Many things affect price besides sound, such as pedigree, previous owners and the shop you are in3- If the person selling the violin tells you it is a Berlusoni from the Ambrosian period, take the instrument for a second opinion from a dealer who has no financial interest in the transaction and who, preferably, isn’t trying to sell you something from their own stock.4- If someone tells you that you have to up your budget by 10k to get anything decent, remember, they would probably say the same thing no matter what you told them your original budget was.5- If someone tells you a good bow is wasted on a good but not great instrument, they are lying.6- Keep looking- the best place to shop for an instrument is on your friend’s instruments. If somebody has something you like, try it and find out what it is.